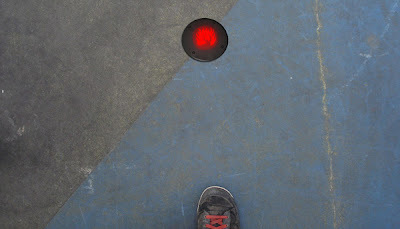 An iconic image of a flame is incorporated in circular light objects on the ground and in several information stations, that together form the marking. The image of the flame shows a visual connection with Zadkine's statue commemorating the bombing of Rotterdam. 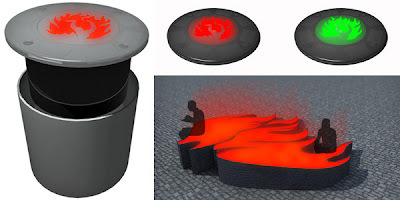 The light objects come to life at night when the solar-powered LEDs illuminate the icon. This physical marking of the fire limits is coupled with information about the historic meaning of the bombing, accessible through the information stations and a website. The effect is to be experienced at two seemingly disparate scales: the intensely local, and the metropolitan. A person walking through the streets of Rotterdam would not doubt run across these lights. He or she would experience the fire limit at its smallest, and most personal scale. For there, by that store, along that bike path, a fire burned and went no farther. There, a string of lights delimit two opposing zones: in the interior, the frightful pentecost of May 14; on the other, refuge. Thus, when viewed in plan, the array of lights give a sense of the scale of absolute destruction experienced that night. Perhaps, then, what is so compelling about Mothership's installation, entitled The Bombardment Periphery, is that it allows people to experience such weight, but at the metropolitan scale. 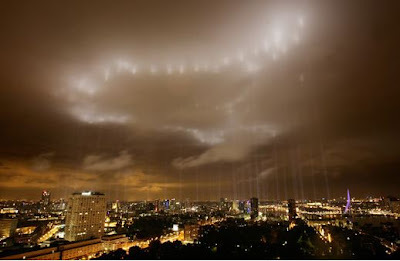 On the evening on May 14, 2007, the Dutch design collective pointed 128 light fixtures, each rated at about 7000 watts (and curiously referred to as "Spacecannons"), into a low, gray, cloudy sky between 10:45pm and 2:00am. To a certain extent, the columns of ethereal light reaching vertically into the clouds are reminiscent of Rafael Lozano-Hemmer's eerie Speer-esque light cathedrals. But, as the photographs and film show, the installation has an incomparable effect of allowing the extent of destruction to be seen from a variety of vantage points on the ground. It is as if an image of Rotterdam, circa 1940, is reflected in the phantom layers above. The two cities, one a fiery maw, the other, a symbol of Europe rebuilt, are connected by columns of light. Light literally tracing the bombs that fell on May 14, 1940.